In this lesson, we will see how we can use Apache Solr to store data and how we can run various queries upon it. Apache Solr is one of the most popular NoSQL databases which can be used to store data and query it in near real-time. It is based on Apache Lucene and is written in Java. Just like Elasticsearch, it supports database queries through REST APIs. This means that we can use simple HTTP calls and use HTTP methods like GET, POST, PUT, DELETE etc. to access data. It also provides an option to get data in the form of XML or JSON through the REST APIs. Request Handlers: The requests a client makes to Solr are managed by a Request Handler. The request can be anything from adding a new record to update an index in Solr. Handlers identify the type of request from the HTTP method used with the request mapping. Search Component: This is one of the most important component Solr is known for. Search Component takes care of performing search related operations like fuzziness, spell checks, term queries etc. 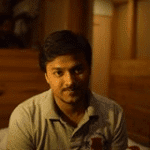 Response Writer: This component is responsible for managing the output format for the queries passed to the engine. 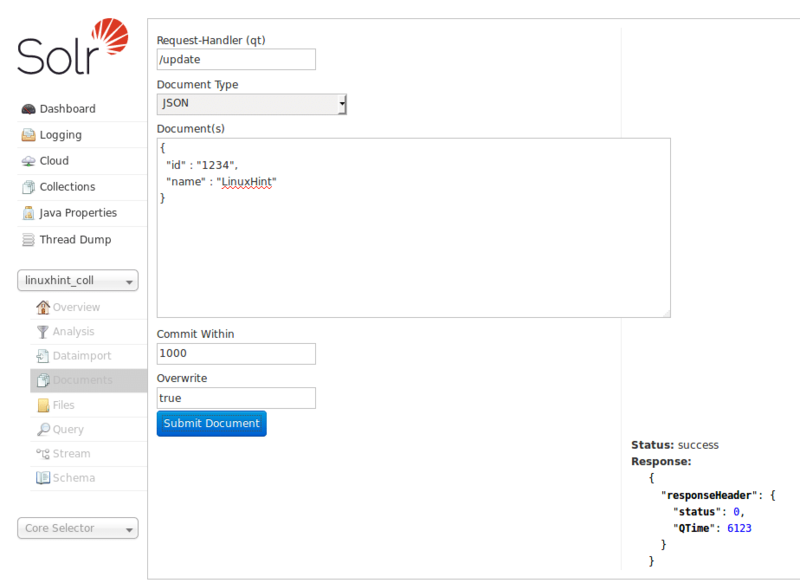 Response Writer allows us to provide an output in various formats like XML, JSON etc. Analyzer/Tokenizer: Lucene Engine understands queries in the form of multiple tokens. 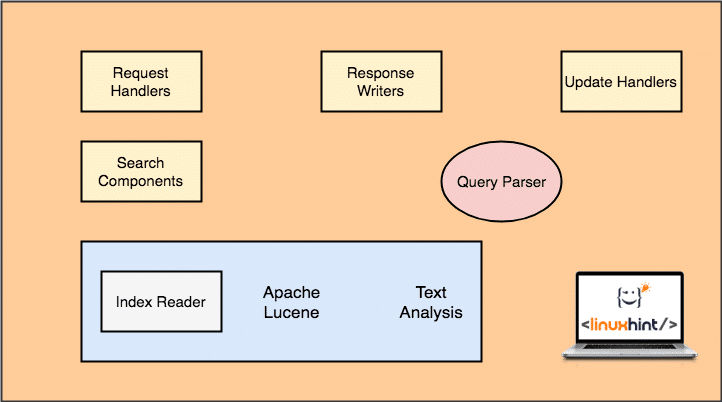 Solr analyzes the query, breaks it into multiple tokens and passes it to the Lucene Engine. Update Request Processor: When a query is run and it performs operations like updating an index and data related to it, the Update Request Processor component is responsible for managing the data in the index and modifying it. To start using Apache Solr, it must be installed on the machine. To do this, read Install Apache Solr on Ubuntu. To start, let us consider a Collection in Solr which we call as linux_hint_collection. There is no need to explicitly define this collection as when we insert the first object, the collection will be made automatically. Let’s try our first REST API call to insert a new object into the collection named linux_hint_collection. As Solr has an excellent way of interaction with HTTP RESTful APIs, we will be demonstrating DB interaction using the same APIs from now onwards and won’t focus much on inserting data through the Solr Webpage. 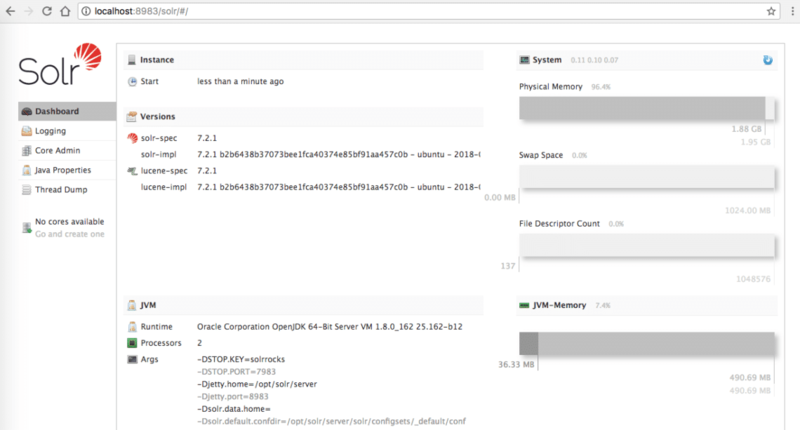 We see two collections here which exist in our Solr installation. In our last REST API, we queried data using a specific ID. This time, we will get all data present in our Solr collection. Notice that we have used ‘*:*’ in query parameter. This specifies that Solr should return all data present in the collection. Even if we have specified that all data should be returned, Solr understands that the collection might have large amount of data in it and so, it will only return first 10 documents. Till now, all APIs we tried were using a JSON format. This time, we will give a try to XML query format. Using XML format is extremely similar to JSON as XML is self-descriptive as well. Let’s try a command to delete all data we have in our collection. curl "http://localhost:8983/solr/linux_hint_collection/update?commit=true" -H "Content-Type: text/xml" --data-binary "*:*"
In this lesson, we looked at how we can use Apache Solr and pass queries using curl in both JSON and XML format. We also saw that the Solr admin panel is useful in same manner as all curl commands we studied.